The Dell™ PowerConnect™ 2816 switch offers incredible value, flexible management capabilities and energy efficient power savings. These switches are ideal for businesses, branch offices, schools and retail establishments with smaller network environments. It offers further savings through intelligent green port technology. The Dell PowerConnect™ 2816 switch offers incredible value to customers by delivering Web-managed capabilities that allow users to manage the switch through an intuitive Web interface. This 16-port version is scalable from small workgroups to aggregation solutions at the branch office requiring Gigabit Ethernet. The 16-port switch also saves power by reducing power consumption up to 64 percent on copper ports with short cables, and has energy efficient capabilities that automatically decrease power on any ports that detect unused or powered down devices — saving both energy and money. The PowerConnect 2816 LAN switch is a high-performance Gigabit Ethernet solution delivering full wire-speed switching across all ports and Web-managed features. 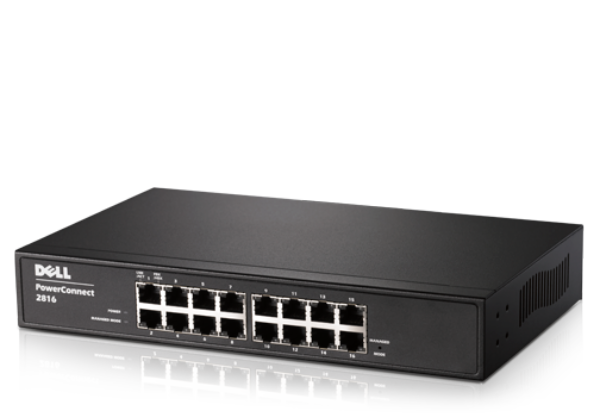 The 2816 ships to you as an unmanaged switch for plug and play deployment, but with a push of a button, you can easily convert the switch from unmanaged to a Web-managed switch with the ability to set IP address, configure virtual LANs (VLANs), set Quality of Service (QoS) priorities, and port mirror for intrusion detection and troubleshooting. The PowerConnect 2816 delivers an all-Gigabit solution for your networking needs. The 2816 delivers wire-speed performance at all three Ethernet speeds — 10 Mbps, 100 Mbps, and 1 Gbps. And with wire speed switch capacity, you can be sure performance is delivered where you need it. This PowerConnect™ switch is backed by an industry-leading, Lifetime Limited Warranty1 which guarantees Basic Hardware Service (repair or replacement) for life. While Basic Hardware Service delivers reliable support for your hardware, most organizations benefit from additional levels of support, to protect their IT investment and maximizing productivity. We recommend Dell ProSupport™, an enhanced suite of services that includes: 24x7 tech support, accelerated response times, immediate access to L2 technical experts and proactive support options. Compare the additional features of ProSupport here. Go beyond the basics and start transforming your IT infrastructure into a true business asset. The right support is not one-size-fits-all, it's what fits your environment. Dell ProSupport provides flexible and reliable support that empowers you to customize services to meet your unique business needs. Choose support based on how you use technology and where you want to allocate resources. Further maximize the availability and stability of your infrastructure through enhanced support options such as: Asset and Data protection, Specialized Onsite2 Services and Remote Advisory Services. Streamline patch management and get detailed reporting with Proactive Maintenance. Get advice via telephone access to technical expertise on applications and solutions such as Microsoft® Exchange, Virtualization and more. And for more complex IT environments, choose the Enterprise-Wide Contract option which provides a designated Service Delivery Manager, performance benchmarking, proactive planning and custom reporting. To learn more about Dell ProSupport visit www.dell.com/prosupport. Dell ProConsult™ global infrastructure consulting services can help integrate your new enterprise hardware into an existing or evolving IT infrastructure. We can provide guidance whether you’re adding single or multiple servers, a storage area network or virtualizing your environment. We can also help you enhance the overall performance of your IT infrastructure and data center by consolidating software and hardware, reviewing data usage to optimize the environment, developing a business continuity plan and by helping you migrate to standards-based technologies. We utilize skilled solution architects, innovative tools, automated analysis and our own intellectual property to give customers rapid insight into the root causes of unnecessary complexity. We seek better answers than traditional service models, based on our belief that solving problems should not need armies of people. Our strategy is to help customers quickly identify high-impact, short-duration projects that deliver ROI and free up resources to obtain competitive advantage. The result is practical, action-oriented plans with specific, predictable, measurable outcomes. From Data Center Optimization to Server Virtualization to Systems Management, our consulting services help you build a more efficient enterprise. Dell helps simplify implementation with deployment services that speed time to production of new hardware and IT solutions. During the initial system-build of your server, we can customize software and hardware to match your specific requirements. By helping you rapidly deploy new capabilities while minimizing disruptions, we can contribute to improved efficiencies and lower costs. Our education services provide training and certification courses to help you and your team better manage and use your new hardware, so you can reap the full benefits off standards-based technologies.